"The Actiniaria are a group which offer an excellent field for study in this direction. They are preeminently animals which cannot be understood unless every avenue of approach to their problems be explored. 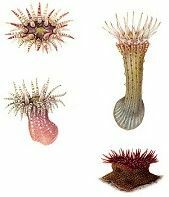 It is possible, for instance, to differentiate Actinian species, in certain cases, on the basis of their various modes of sexual and asexual reproduction; and as work proceeds, other such means will doubtless become apparent". Pisces Conservation are delighted to release "British Sea Anemones" as a download, for Windows PCs and Macs, with fully searchable text and hyperlinks for ease of navigation. The books contain over 100 text figures, and 33 plates, including exquisite colour illustrations of the species. As with all our e-books, the quality of reproduction of illustrations and text is excellent. Format: PDF E-book by digital download. Download size 21.9 MB.